Members of UNG's national championship softball team pose with President Bonita Jacobs and university executives during the UNG Trophy Tour '15. The University of North Georgia (UNG) softball team's national championship trophy was on public display Tuesday as part of the UNG Trophy Tour '15. Members of the team and coaching staff delivered the gold to more than 30 local businesses and offices in gratitude for the support offered to the team during its road to the championship in May. The Nighthawks won the NCAA Division II softball championship in Oklahoma City on May 25 to claim the university's first-ever national championship. Each trophy tour stop featured a group photo with the team, the trophy and Nigel the Nighthawk. During the trophy stop at Price Memorial Hall on UNG's Dahlonega Campus, Athletic Director Lindsay Reeves presented President Bonita Jacobs with a replica of the championship trophy for display by the university. During the trophy tour, the team was recognized by the City of Dahlonega and Lumpkin County Board of Commissioners at Hancock Park in downtown Dahlonega. Chris Dockery, chairman of the Lumpkin County Board of Commissioners, and Dahlonega Mayor Gary McCullough presented the team with a proclamation honoring the historic accomplishment. The day of celebration ended with UNG Athletics hosting the Dahlonega Chamber of Commerce's Business After Hours event at Coleman Field House, where the trophy and facilities were on display for the local community. The 2015 NCAA Division II Softball Championship marked the fourth time UNG's softball team has advanced to the final stage. The team's most recent advance to the national championship tournament was in 2011; the program earned a spot in three championships in a row from 2009-11. Timely hitting and an excellent performance by NFCA National Pitcher of the Year Courtney Poole propelled the team to a 5-0 win over Dixie State in the championship game. For the players, coaches and fans, it was the perfect end to an electric season; for seniors Tiffanie Burns, Kim McMillan, Meagan Stover, Taylor Anne Merritt, and Rochelle Shuman, it marked the perfect end to their collegiate softball careers. 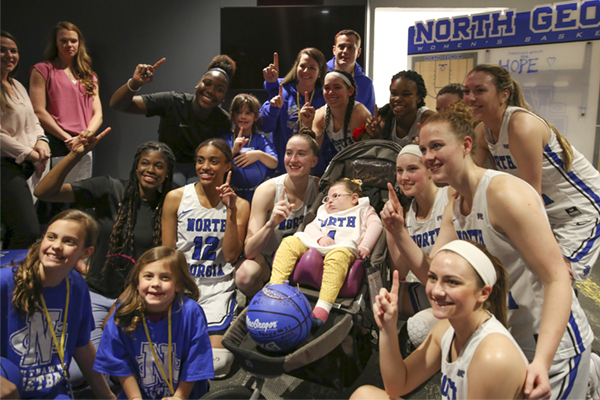 "This championship title belongs to all of us," Head Coach Mike Davenport told a crowd of supporters at nearly 1 a.m. the day after the championship, during a celebration at UNG's Haines & Carolyn Hill Stadium. "It belongs to the players, the alumni, the university and the community, and everyone who has supported us. We brought back the gold for you. I am so proud of this team." For complete coverage of the Nighthawks' championship season, including a photo gallery, videos and post-game press conference from Oklahoma City, read the full story about the championship game on the UNG Athletics website at http://ungathletics.com/news/2015/5/25/SB_0525154002.aspx. To view photos from the UNG Trophy Tour, visit http://ungathletics.com/galleries/.